we can have either an inquiry, or put the money into addressing the (known) root causes of the problem. I want to address the second point first, because it is the most insidious, and apparently unquestioned of the two. It is becoming an accepted truth that there is money out there, bulging out of a briefcase in someone's office perhaps, just waiting to be spent wherever the public decides to aim it. Apparently, though it is never stated so baldly, the Canadian public merely needs to make a choice: inquiry, or action NOW. It's up to us! This is a classic false dichotomy. Only limited alternatives are presented, when in fact there are many more ways to approach the issue. Allowing this to be framed as an either or situation is incredibly dishonest, but plays wonderfully into divide and conquer tactics. Why so problematic? First off, the briefcase stuffed near to exploding with money does not exist. Neither for an inquiry nor for addressing underlying causes of Indigenous vulnerability. Can the money be found somehow? Absolutely, but that is not a given. What IS a given is that this government is incredibly hostile to the idea of an inquiry and has done next to nothing to address root causes so far, despite repeated calls to do exactly this. Just because the issue of a national inquiry on MMIW is gaining public traction does not mean we are going to somehow magically alter this government's attitude. It is most certainly not the case that we, the public, will simply come to a decision and provincial and federal governments will march to our tune. More damaging is the way in which the either/or 'choice' is being presented. Essentially, if you are one of the people supporting a national public inquiry into MMIW, then you are making a choice to spend all of the available (imaginary) funds on that INSTEAD of spending it to alleviate (supposedly known) root causes. You are delaying action. You are actively putting more Indigenous women and girls into harms way. You are going to be responsible for all of the Indigenous women and girls who are disappeared and murdered until such a time as an inquiry wraps up and action can finally be taken. That is the logical extension of the logical fallacy at play here, and it is vile beyond compare. To allow this debate to be framed in such a way actively vilifies grieving families, vilifies grass-roots organizations, vilifies Indigenous peoples and Canadians who give a damn and want MMIW to become a priority. It is a way to once again place the entire blame for further violence on the heads of those who have been the ones doing their best to get these issues addressed. Decades of complete inaction on the supposedly universally known root causes of all this violence by various levels of governments are washed away clean by the claim that if only people would stop calling for an inquiry, real action could be taken. Apparently our saviours were there all along, just waiting for us to stop interfering. I would ask that people discussing these issues in the media not accept this dichotomy and not allow themselves to be divided into two camps: either in support of an inquiry or in support of 'action'. We can and should be engaging in both. To those claiming we already understand all of the root causes, I say this: A quick survey of the op-ed pieces published in the last two weeks alone should quickly disabuse you of any notion that there is consensus on root causes. Theories vary widely, often ignoring the research that has been done on the issues, and more often than not doubling back to simply blame Indigenous peoples for not overcoming colonialism and systemic racism well enough or quickly enough. If that is what is so 'well understood' then a discussion on a national level is sorely needed, and the sooner the better. 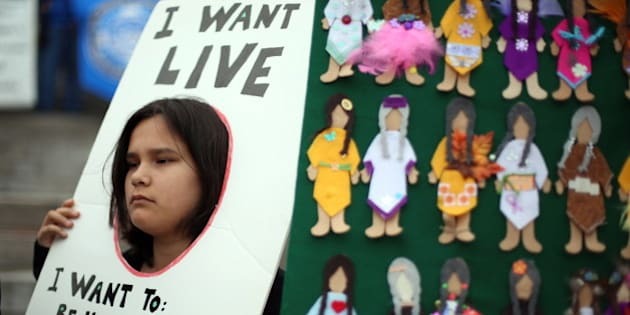 Indigenous peoples are calling for a national investigation that is centered on the families of missing and murdered Indigenous women, and they are also calling for immediate action. This nation is rich in monies directly derived from Indigenous lands and resources. Please don't try to tell us Canada just can't afford to do both.